Marital mediation may not be among the skills taught in design school, but nudging a squabbling couple toward agreement does represent a big part of Ali White’s work for Peregrine Design/Build. The addition Peregrine carried out for Brokaw more than doubled the 1200-square-foot home he bought in 1995. The living room and kitchen were enlarged, a second full bath was installed, and a garage and mudroom were built. Peregrine earned one of its awards for the work it did on Brokaw’s home. It won another for a bathroom remodeling project — the sort of work that accounts for many of Peregrine’s jobs. Most design/build firms do a lot of bathroom and kitchen work, but Peregrine has a distinctively stylish approach. Deetjen notes that in the case of its 2009 bathroom award from Better Homes and Gardens, the company sought to create a warm look despite the presence of typically “cold” fixtures. An abundance of wood was used in this setting, while a lime-green wall above a pedestal sink and softly glowing task lighting further enhanced the room’s warmth. With an economic recovery seemingly under way, “The scope of our work has lately gotten bigger,” Frost notes. For example, a couple from New York City recently chose Peregrine to remodel the 4500-square-foot home on 260 acres in Richmond they bought from Phish front man Trey Anastasio. Frost has come a long way from washing windows in Burlington’s Hill Section, the gig he and classmate Thad Fisco put together after graduating from the University of Vermont in 1987. They moved from that into painting and repairing residential exteriors. And when a Bayview Street resident offered Frost and Fisco the opportunity to build an addition to his home, they quickly accepted, “even though we really didn’t know how to do it,” Frost recalls. The friends sought help from a skilled carpenter, from whom they learned the rudiments of construction. A few years later, Fisco left Peregrine and Vermont to take on other challenges in the construction business. For the next several years, Frost, like many contractors, handled building projects without relying on the services of a professional architect. Sketching designs on napkins makes it hard to contain costs, however, and “owners aren’t pleased when that happens,” Frost says. So, about five years ago, he decided to enhance his firm’s expertise. 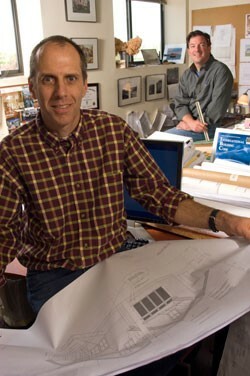 Frost hired Deetjen, who had worked for the Bread Loaf architecture and construction company in Middlebury, and began seeking design advice on high-end projects from White, an independent consultant who got her start at Close to Home, a bath-and-kitchen fixtures and accessories retailer in Williston. Peregrine also gets marketing help from Joanne Palmisano, who’s writing a book on the reuse of materials in design. Professional competence should be the main standard by which a home-owner judges the suitability of a design/build contractor, Deetjen advises. “You take risks by not using professionals,” he says, noting that Vermont has no licensing system for builders. “And that results in there being a lot of crap out there,” Deetjen declares. Unlike most doctors, though, designers tend to the aesthetics of a home as well as its physical qualities. That’s why it’s important for clients, when choosing a firm, to compile a wish list that identifies both items and features they want to change and those they want to retain, Deetjen continues. “Tell us your dreams,” he says. “It may turn out that they’ll have to be phased in over time, so we’ll come back to you with a revised wish list.” The process of setting priorities is also affected by factors such as zoning regulations and the size of a project’s budget, Deetjen explains. Peregrine let more light shine into a Shelburne condo, while simultaneously enhancing its lake view, by knocking down walls that had separated a series of small rooms in a former manor house. Green design, however, has become part of conversations with many clients, Frost notes. That may involve simply insulating a home with “a nice tight skin” or installing a new boiler and energy-efficient lighting. Peregrine also encourages use of local products such as flooring and cabinetry made from Vermont hardwoods, Frost says. Peregrine has been thinking green for a number of years, Frost adds. While not unusual among Vermont’s design/build firms, that eco-consciousness is another example of how a savvy company evolves as its clients’ wish lists do.